The Mesoamerican ballgame was played over a period of three thousand years from the southern United States all the way south to Nicaragua. 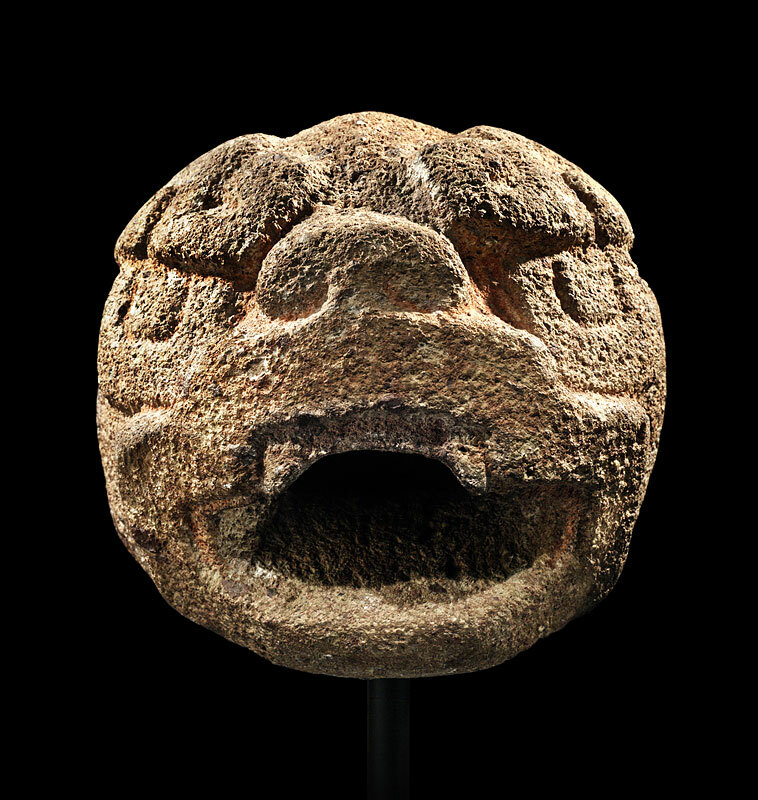 Veracruz and Maya areas were home to very strong and long-lived ballgame traditions. There were many regional and temporal variations of the game. In some versions, the ball was deflected by the hips and the hands were not used at all. But other versions allowed the use of bats, sticks, or handstones (manoplas) such as this one. 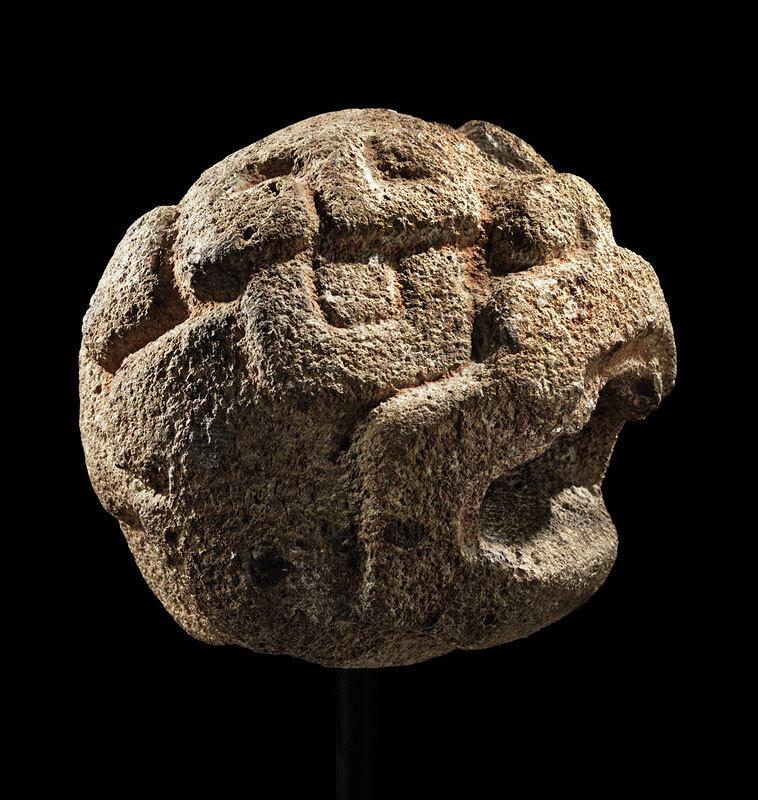 The manopla would have been held by a ballplayer to hit and keep in motion the solid rubber ball. The jaguar is characterized by huge, U-shaped eccentric eyes surmounted by scroll eyebrows. A wide pug nose projects a bit, but is flush with the raised lips. This large maw has a broad, flaring quatrefoil forming the mouth, framing the exposed upper gum where two fangs emerge at the corners. Behind, there are two large scrolls carved in low relief, emerging from the cheeks. Although there are two, these may represent the tail (as if viewed in profile on each side, independently.) The two halves of the head meet in the center at a gentle peak. As the most powerful animal of the region, the jaguar was an entirely appropriate emblem for a ballplayer to use in his contest. The vast majority of extant ballgame paraphernalia hails from classic period Veracruz. This manopla is a rare example in pure Olmec style. Susanna M. Ekholm, “Ceramic Figurines and the Mesoamerican Ballgame,” pp. 241-240, in The Mesoamerican Ballgame, [Tucson, 1991], Vernon L. Scarborough and David R. Wilcox, editors. Elizabeth P. Benson and Beatriz de la Fuente, editors, Olmec Art of Ancient Mexico [Washington, DC, 1996] no. 15, pp. 178-9.